On January 17th, the Yamamoto Noh Theater, in the heart of Osaka gave JETs and Osaka AJET an unbelievable opportunity to collaborate on an extremely unique internationalization project. Last November, I met Ms. Yamamoto after their first “English-only” show. She and her husband met with me a week later, and I explained to them how I felt about involving JETs in opportunities to connect our cultures and share that with others. It turns out, they felt the same way, and had been looking for ways to make their performances appeal to foreign guests. 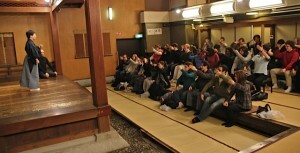 We decided that it was a great idea to work together on future projects because of our common interest in Osaka’s international community, the Yamamoto Noh Theater invited Osaka JETs to watch a private performance, and participate in an educational workshop about Japanese traditional arts, and meet the performers. 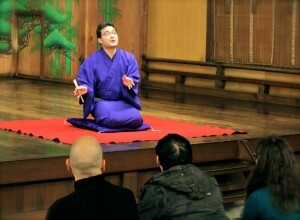 Kyokudo, Nanyo performed Kodan storytelling, while Katsura Kaishi performed Rakugo, traditional Japanese comedy, in English. Tanigawa Megumu, a young master of a Japanese traditional restaurant where geiko (geisha in the kanto region) entertain guests by music and dance, and also gave an explanation of Geisha history in Kansai and performance. Finally, 4 Noh group members explained a bit of Noh theater and had JETs practice singing and moving in the way the actors do. During and after the performances, the artists invited JETs to give feedback about the English explanations and fielded many questions about their special skills. Their hope was to gain a western perspective on the best way to explain traditional Japanese arts, and learn the English needed to express their “English-only” shows. At the end of our workshop, JETs were invited back for more private workshops and in-depth collaboration on their future events. Osaka JETs were emphatic in their enjoyment of the event. One member was quoted as saying that it was “fun, educational and relaxing all at the same time!”. When asked about participation in future events, the JETs overwhelmingly said they were excited to take part. This event exemplified what JET is designed to accomplish and with a little luck, coordinators of this event hope that these JETs will not only participate in many future events and share these experiences with incoming JETs, but also take this knowledge home to share with JETs’ communities in their home countries! Matthew Cook » JETs and Diplomats Dinner in Umeda, Osaka.